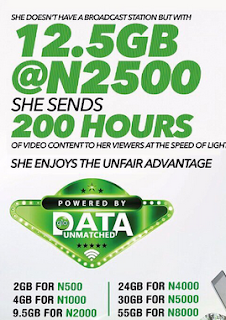 Glo NG has yet again unveiled another huge data plan of 180GB for N20,000 after introducing Unfair Advantage, Free Youtube and iFlix Video Streaming plans. Glo is really the grandmaster of data. 180GB for N20,000 isn't a bad one, and would be suitable for heavy download users, cyber cafe operators, business centers, schools, hospitals, offices, companies, etc. Considering the fact that Glo is currently the only network offering cheap data plans, but still lacking behind in terms of data network. Glo data network is really poor in almost all locations in Nigeria as a country. They really need to look into this and improve their network speed, and am sure if at last they do, it will surely benefit the company as well as their subscribers. If you are an heavy internet user, then this plan will be suitable for you. It works for all devices ranging from Android, iOS, Windows phone, Laptop computer and every internet enabled devices. To subscribe for the Glo 180GB for N20,000, just dial *777# and follow the on-screen prompt. What do you have to say on this one? They're still merely chasing shadows, let them get their priorities right first. I wonder which company would want to risk sending there business into oblivion by using such an unstable network. Wow Glo moving forward but they just have to improve more on their network speed.